Beautiful bright and elegant contemporary city centre apartment with modern kitchen and superb new bathroom with very big shower and strong water pressure. Air conditioning through-out. Fully equipped with washing machine, dryer, over, fridge-freezer, hair-dryer, flat screen TV, strong wifi / internet. Quit bedrooms! Secure parking available. 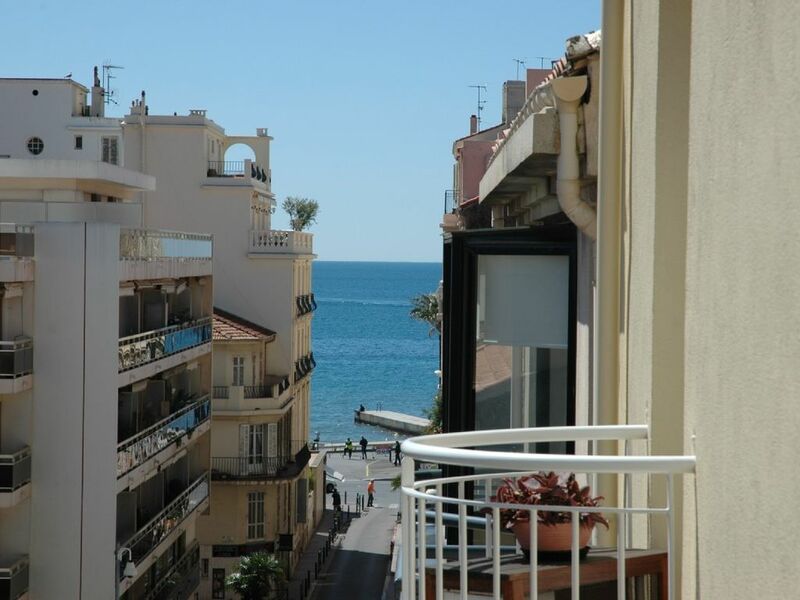 In the heart of Cannes, 1 min walk to the sea front, 3 min to the festival hall. 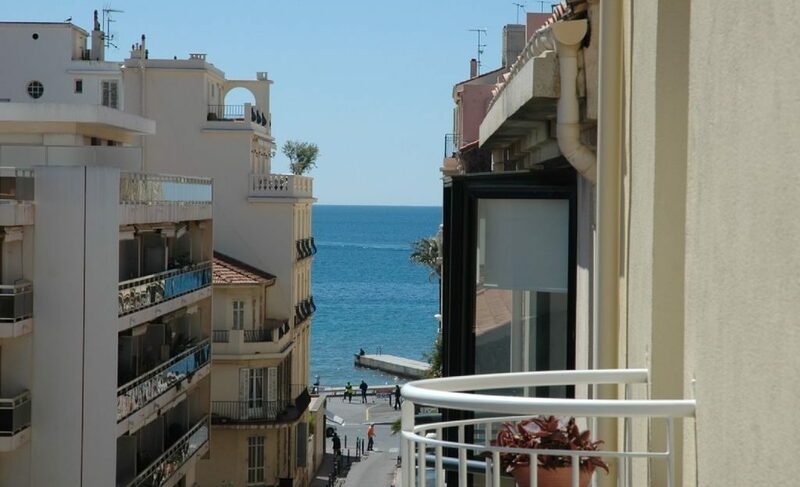 This stylish and modern apartment is located in the most prestigious area of Cannes: ‘Le Carré d’Or’. 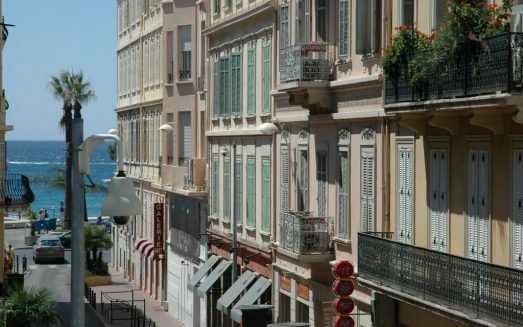 5 star hotels, glamorous shops, stylish restaurants and the famous rue d’Antibes are all only minutes away. No need for a car. The ideal place for business people and families on holiday. ‘L’Azur’ is on the 4th floor of a well maintained classical building. The entrance is elegant and the modern lift is of a very comfortable size. The apartment has 3 small balconies. Kitchen and living room are south-west facing. 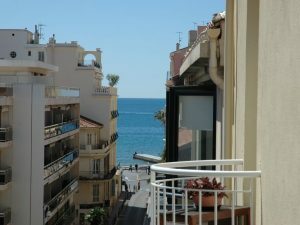 L’Azur is very bright and sunny with open views over roof tops and all the way to the hills as well as the sea. There are 2 very quit bedrooms with a total of 4 single beds (convertible into doubles) + 1 double sofa bed. All beds are 2m long! Last minute enquiries are welcome. Long term rental is possible during the winter season. There is NO space for a baby-bed! Ask about apartment LE NOSTALGIQUE (46624). LE NOSTALGIQUE has a baby-bed, high chair, baby cutlery etc. and more space (75m2). Extra cleaning can be provided: € 50 (3 hours). Towel and linen change during stay: € 20 per person. Closest supermarket: MONOP’ on place Gambetta (1min walk). This takes about 40min, then less then 10min walk. Clients comments: We booked l’AZUR for 2 weeks last summer 2010. The apartment was just perfect for us. Modern, clean and bright. Couldn’t have been more central. Very, very good location. The sea is just a few steps away and you really won’t need a car. Bars, restaurants, dance clubs and shopping is all around you but the apartment is really quite. Up in the 4th floor with no visa-vi and double glazing. 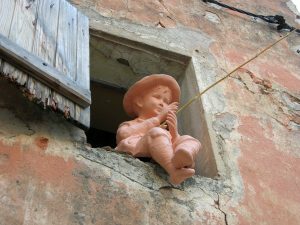 We at times took the train to see Antibes and Monaco. All in easy reach. We walked 5 to 10 min from the station to the town centre. All to say: we loved it and wish to come back and YES, we will make publicity and send family and friends. Thanks for your help and great tips. Der Markt gleich um die Ecke war super! Danke für den Tip! Frische Croissants, Baguette, Wein, Fisch… Tolles frisches Gemüse, echt so wie man sich die Cote d’Azur vorstellt. Danke für den Tip! Mougin nördlich von Cannes ist echt einen Besuch wert! Nur 15 Minuten mit dem Auto und WOW: Gemälde, Statuen, super Aussicht, echt nettes Dorf und natürlich wieder ‘gutes Essen’!!! Eine Woche hat nicht gereicht! Wir kommen wieder. Clients comments: Très belle appartement! Belle vue dégagée et calme! Nous nous sommes merveilleusement bien reposés. Franchement, il y a beaucoup à voir et faire à Cannes, mais nous avons préférer de longues promenades sur la Croisettes et aussi aux long des plages de sable. Un séjour fort agréable. Merci!